Septic tanks are not commonly found in a large city like Atlanta - they are more often than not found in rural or suburban areas. A great majority of the plumbing services we provide are in these types of areas surrounding Atlanta, Ga. So, we often get questions about the fabrication and construction of septic tanks. A common question is... Are septic tanks plastic? Generally, septic tanks are usually made out of fiberglass or concrete. Fiberglass is considered as a plastic - it's a fiber-reinforced type of plastic that is composed of glass fibers. 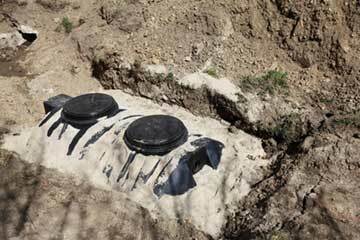 The use of plastic septic tanks is very common throughout the United States. They are designed for both residential and commercial use. They are perfect for trailers, RV parks, portable buildings, tiny houses and more! The one use that plastic septic tanks are NOT recommended for is for storage of chemicals. Below we list the pros and cons of concrete and plastic septic tanks. Each type has several advantages and dis-advantages so in the end, which one you select is entirely a matter of personal preference and the location of where you are installing the tank. In Georgia, plastic tanks are approved but the minimum size is a 1000 gallon tank. This is adequate for a 3 to 4 bedroom house. But, if the home uses a garbage disposal then the size of the tank must be increased by 50%. To many homeowners, how the septic tank works is a bit of a mystery. Let us help you with this easy guide. Your septic tank is buried underground, somewhere on your property, usually not too far from your building. There is a drainfield surrounding the tank. Water from your home (all the water) runs through one main drainage pipe into your septic tank. The solids in the water eventually settle down to the bottom of the tank (creating a muddy sludge). And any oil and grease eventually float to the top of the tank forming a layer on top of the water. The remaining water is pre-treated through some piping in the tank and then flows out of the tank into the drainfield. What Is The Best Septic System To Install? Choosing which type of septic tank to install, whether it's plastic or concrete depends on your needs, your location and your budget. Step 1 - Decide what size tank you would need. The size is determined by guesstimating how much water you use daily. Generally, a 1000 gallon tank can accommodate a 4 bedroom home. Step 2 - Know the ground you are installing the tank into. If the ground is full of gravel you will likely need a pressure-type septic system. Step 3 - Decide on which pump system you want or can afford. All septic tanks use either a centrifugal or a turbine pump. Centrifugal pumps are less expensive but also less reliable in the long run. Step 4 - As your neighbors about their experiences. More than likely, since they are close by they will have the same soil conditions and issues as you would. How often should you pump a 1000 gallon septic tank? A household of 2 people and a 1000 gallon septic tank should be pumped every 5.9 years. What is the average cost to install a septic tank? The cost to install a septic tank ranges from $2,812 to $8,431. How many loads of laundry can I do if I am on a septic tank? It's recommended to do no more than 1 load of laundry per day. Better to spread it out throughout the week than to do multiple loads in one day. If you have any questions about septic tanks for your residential or commercial property, call the Atlanta plumbers - Atlantis Plumbing today at 770-505-8570. We are available 24 hours a day, 7 days a week.